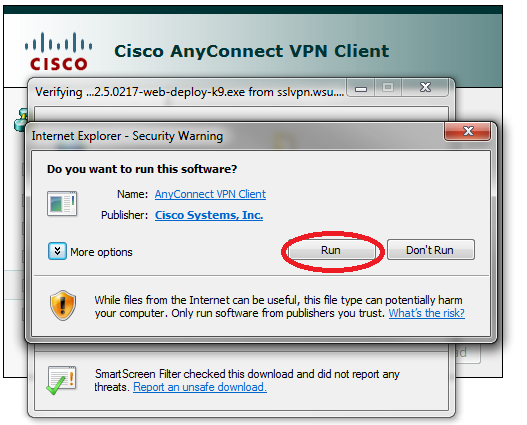 You must be off campus to use these Cisco AnyConnect Essentials client instructions. A manual installation option is available if needed. Enter your AD Username (WSU Network ID) and password and click LOGIN. 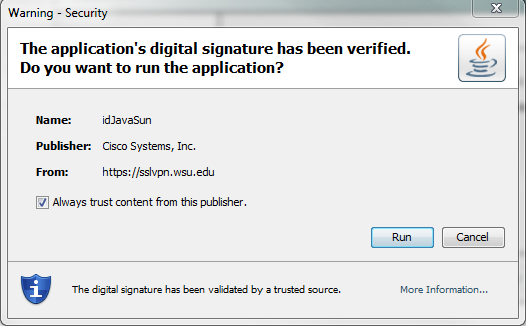 Click “Run” for the JavaSun download. If you receive a User Account Control message, click “Yes”. 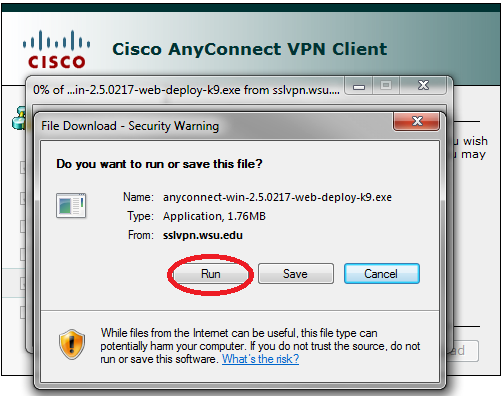 If you receive the following VPN Client Downloader window, add https://sslvpn.wsu.edu to the Trusted Sites Zone in Internet Explorer. Click “OK” on the Internet Options window to continue. 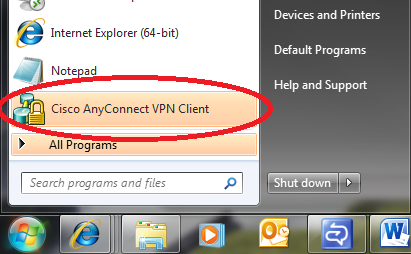 Click “OK” to the VPN Client Downloader. If the Client does not continue with the setup, simply refresh the page or Enable ActiveX and add https://sslvpn.wsu.edu to the Trusted Sites Zone in the browser then start over. 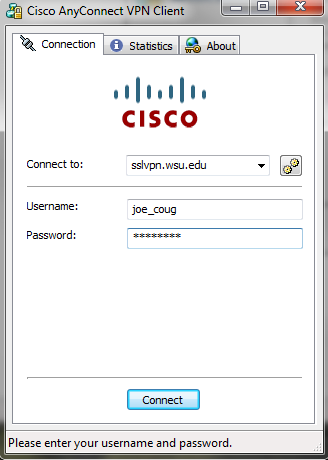 When you get the “Connection Established” window, and WebLaunch box “Connected is checked, you are now successfully connected to the WSU Network via an SSL connection. 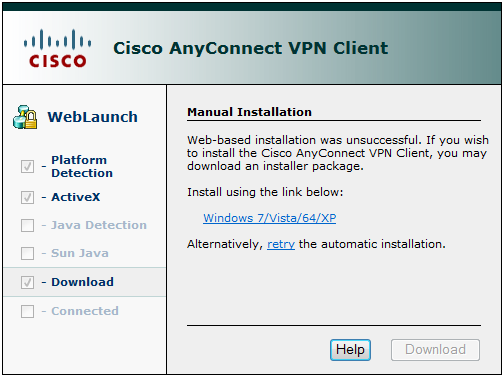 If the WebLaunch does not Automatically establish the SSLVPN connection, retry or install Client following the Manual Installation by Clicking on Windows 7/Vista/64/XP as shown in the window below. In Firefox the downloaded file will look like the screen below. Click “Save File”. Double Click in the Firefox Downloads window to start the AnyConnect install. Both Firefox and Internet Explorer will give a similar Security Warning message. Click Run. 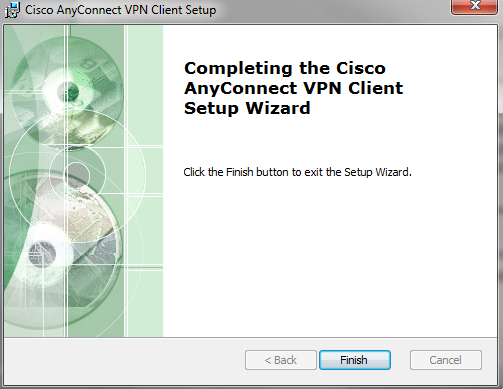 Click ”Next” to start the Cisco AnyConnect VPN Client Setup. 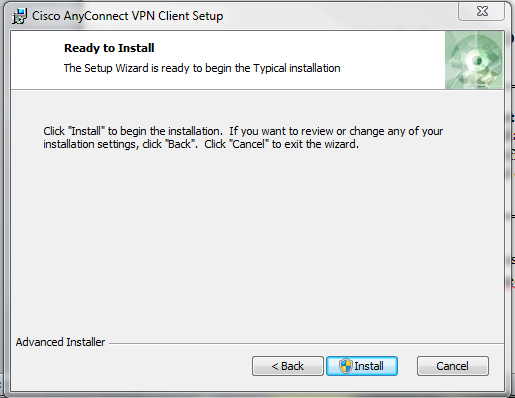 Click “Install” to begin the Setup Wizard. Let the wizard run. 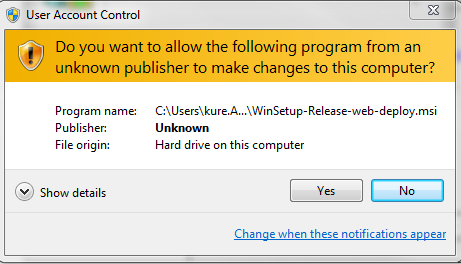 If a “User Account Control” message appears ( shown below), select “Yes”. Otherwise, when completed, Click “Finish”. 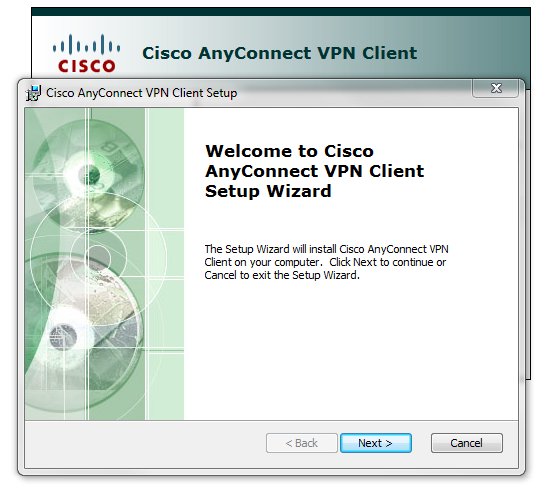 Start the Cisco AnyConnect Client. 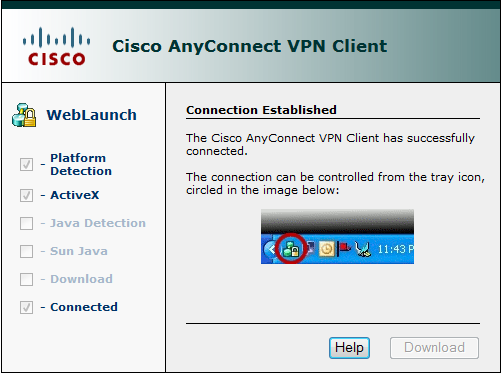 Click on Cisco AnyConnect VPN Client and a logon will appear. 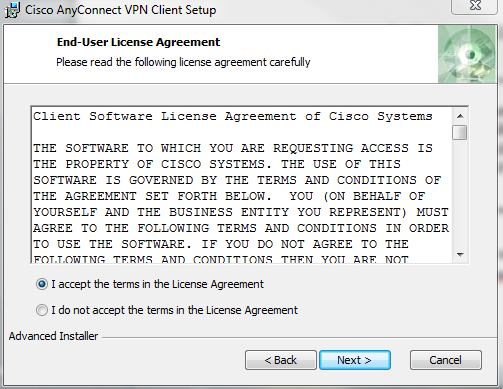 Select sslvpn.wsu.edu in the ‘Connect to:‘ dialog box. The SSLVPN connection should be Established. The AnyConnect Icon will appear. Right Click the AnyConnect Icon, whether in the Quick Start menu or the tray in the lower right corner and select “Open”. Enter your UserID and Password and the connection will be re-Established.